A história de longo alcance de Brașov é melhor explorada em suas ruas, mas apreciar o contexto de cada local pode ser difícil em uma excursão autônoma. Tenha uma visão íntima da cidade em um passeio a pé, visitando monumentos como a Igreja Negra, o Bastião dos Tecelões e a Rua da Corda, com informações culturais e históricas fornecidas pelo seu guia. This ended up a good experience but started off on rocky ground. We arrived at 11.00am as per the booking to find no tour guide. We phoned the local agency who said that they hadn't received the booking from Viator, but they would see if they could find a guide and would call me back. They were very quick to phone back and advised that they could have a guide for us by 12.00 which we accepted... and we were so pleased that we did. 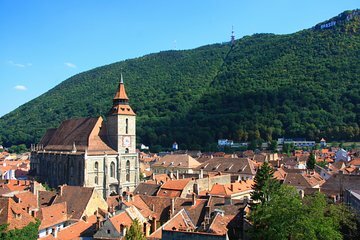 Ioana was wonderful and very informative on the history of Brasov and many of the buildings that we visited. Without her we wouldn't have seen St Nicholae Orthodox Church with its spectacular interior - a sight not to be missed - which is actually outside of the old town walls. If you want to do this trip I would recommend contacting the local agent the day before.